A family in Maine has located their dog after she was lost in the snow for over five days. Albert Silver and his family were shoveling snow when they noticed that their dog Sophie was missing. After spending time searching for her around their property, they still couldn’t find her and became increasingly concerned. 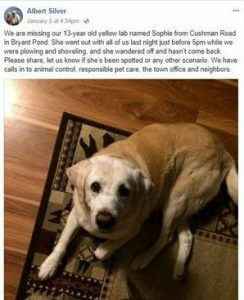 “We are missing our 13-year-old yellow lab named Sophie from Cushman Road in Bryant Pond. She went out with all of us last night just before 5pm while we were plowing and shoveling, and she wandered off and hasn’t come back,” Silver wrote on his Facebook page. With the help of friends and neighbors, they continued to look for Sophie, but still couldn’t locate her. 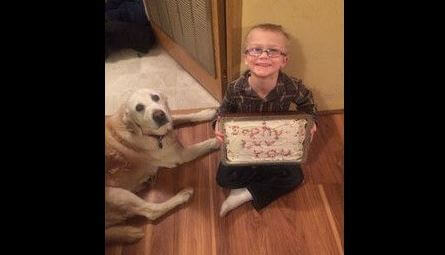 Silver even called animal control, but they hadn’t gotten any calls about a missing dog. His post about the lost dog on social media received a ton of support with over 2,000 shares with many of the people who shared the post being compete strangers. “We looked on foot and by snowmobile and by car,” said Silver. “We were pretty convinced that she had gone somewhere to die,” he continued. Finally, after five days of searching, they saw a head poking out of the snow, which they soon realized was Sophie. Despite being out in the snow for nearly a week, Sophie didn’t receive any frostbite and only suffered from extreme hunger and thirst. Sophie is a yellow lab, which isn’t a breed that’s naturally accustomed to being in the snow for extended periods of time. The Silver family is thankful for all of the people who helped them search for Sophie. They made a video to express their gratitude to the family, friends, and strangers who spent time looking for her. Sophie has since made a full recovery and is working on gaining back some of the weight that she lost while she was missing.